Does your company have a formal statement of it's culture? Can I read it on your website? This statement is often referred to as your Core Values. If you think this is somewhat namby-pamby for my No-Bull style, can I just suggest that businesses such as IBM, Accenture and Tesco all publish their Core Values. Do your Core Values document how staff are expected to behave to each other? How are staff told about this & how is it maintained? Does your culture effect hiring and firing? Would you hire a "star performer" who could help the biz but who probably doesn't fit your culture? Does your staff know it and believe it? How are staff expected to include culture into their normal work practice? Does this all come from top down? Are you driven by the personality, focus & goals of your current CEO? Do sales and marketing follow it? 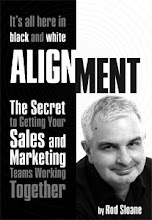 If you have all this, then why do you have a Sales and Marketing Alignment problem?